Hollywood hasn’t been kind to Arab Americans. From films that include “Black Sunday” and “Patriot Games” to the TV shows “24” and “Sleeper Cell,” Middle Easterners tend to be typecast as villains. Such celluloid depiction is one reason Dr. Samir Abu-Absi edited and wrote a chapter for a new book, Arab Americans in Toledo (The University of Toledo Press). But the Gulf War and 9-11 added fuel to vilifying anything Arab or Muslim. “This is a tremendous problem that needs to be addressed with vigilance,” Abu-Absi said. The UT professor emeritus of English was born in Lebanon and came to the States for graduate school. After receiving master’s and doctoral degrees in Indiana, he joined the UT faculty and moved to Toledo, where he has lived for more than 40 years. The 320-page book is divided into three sections: heritage, profiles and interviews. Danny Thomas and Jamie Farr, two celebrities who grew up in the Glass City, are included in the profile section. More than 30 people helped Abu-Absi with the book. They conducted interviews, wrote chapters and tracked down information. “It really was a labor of love that so many people contributed to,” Abu-Absi said. Several of these people have UT connections. 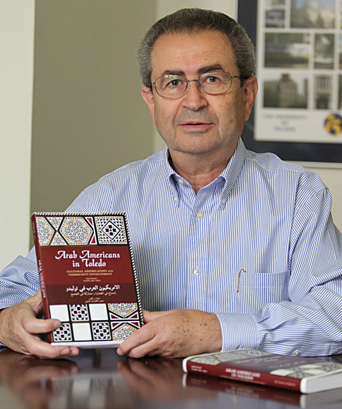 Dr. Saleh Jabarin, director of the UT Polymer Institute, wrote a chapter on the University’s Imam Khattab Endowed Chair in Islamic Studies, and Dr. S. Amjad Hussain, UT trustee and professor emeritus of thoracic and cardiovascular surgery, contributed a chapter on Abdul Moneim Mahmoud Khattab. Interviews featured include George Isaac, UT benefactor and namesake of UT Medical Center’s George Isaac Minimally Invasive Surgery Center; Dr. Amira Gohara, former acting MCO president and professor and dean emerita of pathology; and Dr. Sonia Najjar, UT professor of physiology and pharmacology and director of the Center for Diabetes and Endocrine Research. Dr. Gaby Semaan, UT lecturer in Arabic, and Michelle Davidson, UT associate lecturer in English, conducted interviews. And numerous University alumni wrote chapters and helped with interviews. “As an editor and publisher, I am really proud of this book,” said Dr. Tom Barden, director of the UT Honors Program, professor of English and co-editor of the UT Press. “Dr. Abu-Absi and his co-authors have created a fascinating and delightful portrait of this great Toledo community. Arab Americans in Toledo, $25, is available in the UT Bookstore and at Borders. This entry was posted on Thursday, July 29th, 2010 at 5:04 am and is filed under Features, UToday .